Fr. Peter Luo Xuegang, with the permission of the pope, will be ordained coadjutor bishop of Yibin. But the excommunicated bishop of Leshan, Lei Shiyin may participate in the ceremony. The Patriotic Association’s ongoing campaign to subjugate the Church. Hong Kong (AsiaNews / EDA) - On 30 November, feast of St. Andrew, Fr. Peter Luo Xuegang, will be ordained coadjutor bishop of the diocese of Yibin (Sichuan). Fr. Luo, 47, a priest for 20 years, will be consecrated by the Ordinary Bishop of the diocese, Msgr. John Chen Shizhong, who has reached 95 years of age. This ordination in the official Church is taking place with the permission of the Holy See and the consecrating bishop has long been in communion with the pope. 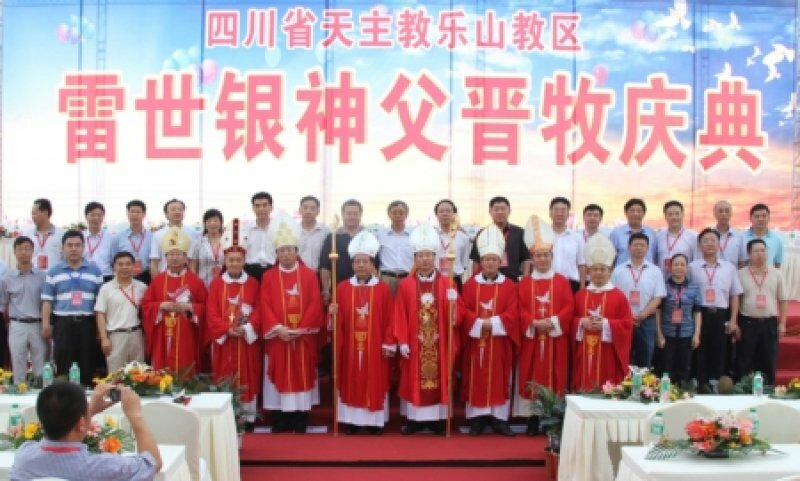 However the faithful of the diocese fear that the illegitimate and excommunicated bishop of nearby Leshan, Paul Lei Shiyin, may participate in the ceremony as a consecrating bishop. Lei was ordained Bishop on 29 June without the permission of the Holy See (see photo). After his ordination, the Vatican issued a tough statement, condemning the act, damaging to the Catholic faith and religious freedom (see 04/07/2011 The Holy See condemns Leshan ordination). Some bishops were in fact forced to participate in the ceremony. Lei Shiyin’s participation at the ordination of 30 November is almost certain, in fact, he is President of the Patriotic Association and the Committee for the affairs of the Church in the province of Sichuan, with a lot of support among the government authorities that almost certainly will want to impress a "patriotic" and "independent" character on the ceremony, going against the Vatican's instructions. For the Holy See, Lei Shiyin, being excommunicated latae sententiae, is not entitled to participate in the Eucharist. Several bishops of neighbouring dioceses, who thought to participate in the ordination, are now afraid to participate because of Lei Shiyin. Fr. Luo Xuegang and Lei Shiyin know each other very well. The first is the nephew of Msgr. Matthew Luo Duxi, bishop of Leshan, who died in 2009. Both were ordained in the same year, 1991 and began their pastoral work in the diocese of Leshan. In 2009, Fr. Luo was transferred to the diocese of Yibin and in 2010 was chosen by the Presbytery of Yibin as a candidate for the succession of Msgr. Chen Shizhong. The Yibin ordinationwill be the first after the two illicit consecrations; in Leshan (June 30) and Shantou (July 14), which deepened a hardening of relations between the Vatican and China that began with the illicit ordination of Guo Jincai as bishop of Chengde (Hebei), 19 November 2010. The number of illegitimate ordinations is part of a Patriotic Association campaign to regain control of the official Church, whose bishops are now mostly in communion with the pope. The campaign of submission of the Church to the Patriotic Association, however, is increasingly meeting with obstacles and resistance from pastors and the faithful (see 18/07/2011 Chinese Church "resists" excessive power of Government and Patriotic Association).